I filmed these BMW M3 at the Modena racetrack. 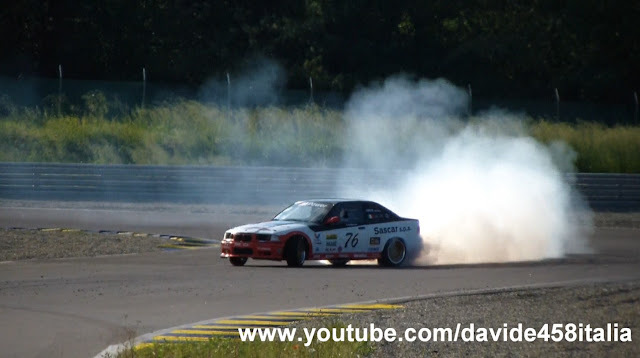 You can see a white BMW M3 E36 start up and fly by on the track, then a green E36 and a white E36 doing some drifting! You can also see a M3 E30 in DTM livery doing some drift and fly by. Listen to the amazing sound! Watch the video and the pictures below. Ho fimato queste BMW all'Autodromo di Modena. Potete vedere l'accensione di una M3 E36 poi passaggi ad alta velocità sul rettilineo. Dopo una E36 verde e una bianca si sfidano in drifting sulle curve del circuito. Vedrete anche una M3 E30 in livrea DTM fare drift. Sentite che sound!